During our consultations, we asked the client in-depth questions about her medical history and previous medical conditions, to gain a thorough understanding of her diagnosed medical conditions and prescribed medications. During our consultations with this client, we determined that many of her conditions such as depression, insomnia, anxiety, Parkinson’s, diabetes, etc. detrimentally affected her memory and learning ability, since these conditions typically cause blurred vision, headache, severe drowsiness, dizziness, and other symptoms that greatly impair cognitive functions. Secondly, we asked the client to obtain a new Form N-648 from her doctor, this time providing a much more detailed explanation of her medical conditions including the origin, nature, extent, and an explanation of how those conditions detrimentally affected her memory, vision, hearing, and learning abilities. This form is very important when obtaining an exception to the English and Civics test. It must be detailed, well prepared, and completed in good faith. The doctor and/or applicant cannot misrepresent their condition(s) under any circumstances to gain an immigration benefit. What’s the name of your doctor? When was the first time and last time that you see the doctor? Did he/she apply any diagnostic tests on you? What medications you are taking now? Why do you think you cannot learn English/U.S. history and government? Describe your daily activities, do you travel by yourself, do you cook, do your own laundry, do you take buses by yourself, etc. 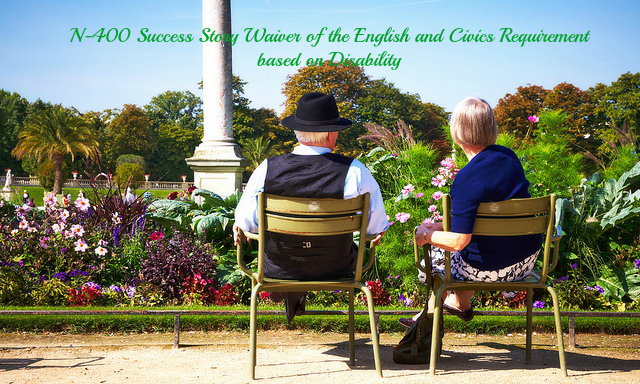 We are happy to report that all went well during our client’s interview and the N-648 waiver of the English language and Civics examination was approved. Our client is now a United States citizen! The bottom line is that applicants must always make sure that their forms have been properly completed and that all of the necessary documentation has been included to support the waiver. It is not recommended for applicants to file on their own, unless they have a good understanding of the process. For more information about our office and the services we offer please visit our website.